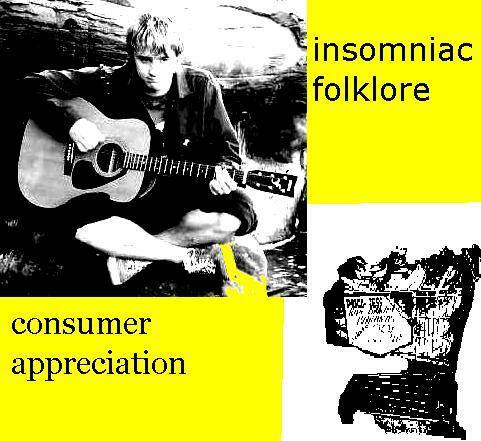 "consumer appreciation" is the second cd from insomniac folklore. this disc freatures 13 new tracks including concert faverates like "gray cars", Patchwork children" and "beautiful bloodshot eyes". this cd ranges from mello folk to near acoustic punk. it also has some surprises (aka. "acoustic music for the dead" amongst others) this cd shows much better production than tyler's first cd "despite it all". and "consumer" also features a 10 page insert with photos and a mini story with illistrations by tyler! this cd is the best thing ever!!! but dont take my word for it... order yours today! i only accept checks at this time. for those of you wanting my first album "despite it all" well... it is kinda out of print. i am sorry... i only made about 120 copies of it. but if you absolutely need a copy of it e-mail me and we can work somthing out.